The history of Marvel Merchandise’s long, confusing and mostly terrible history with Black Widow’s presence on toy shelves is exactly that: long, confusing, and mostly terrible. But never fear, true believers — somehow toy-based representation of Black Widow can get even worse! Wait, what? Lovely stuff. 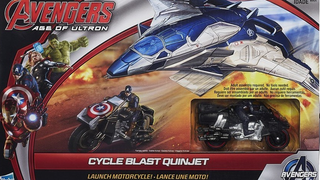 And a cool moment to turn into a toy, for sure — the Quinjet can shoot the bike out as a launcher and everything! So toyetic, a million toy designers wept with joy the moment they saw it. And design a toy on said moment they did. You can see it above, the Cycle Blast Quinjet in all it’s glory, available for $30 everywhere Age of Ultron toys are sold. But can you spot one crucial different between the Cycle Blast Quinjet and the moment from the movie? The bike is totally the wrong design omg so inaccurate Hasbro That’s right, Black Widow has been swapped out in favour of being replaced by Captain America. You know, the dude who she’s going to help out in the scene from the movie. Look how psyched that kid is about this toy. “It’s just like the movie!”, he’s thinking. “Except not like it at all!”. It’s one thing to have Black Widow virtually absent from Age of Ultron’s merchandise extravaganza. It’s a whole other level to actively go about not including her in toys she actually should be part of.